Ingenuity and wisdom, speaks the creative works of art which were wrought by the aged hands of our ancestors. These can be seen in the way they designed and built their houses and palaces in the days of old. These relics lie strewn across our fast growing cities in Nigeria; we walk and drive past them every and pay little or no attention to them. These works have more to teach us about our values and history as a people and as a nation than even the much diluted present-day media. Here is an ancient palace, said to be over 200years old, was built with mud and timber (wood), and yet still standing strong on the soils of Ibadan city, southwest Nigeria. 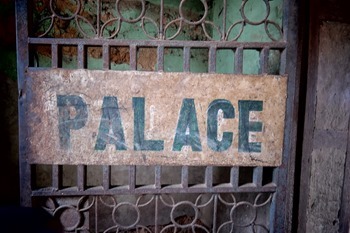 This palace is located in the tropical rainforest region of Nigeria, enduring over two centuries of countless rainfall and sunshine, and has not collapsed. This palace is definitely a unique cultural, scientific and historical object we must do all we can to preserve. The Irefin palace belongs to one of the Royal families of Ibadan.The Irefin clans were warriors in the days of old who settled in the Ibadan area known then as a resting settlement for travelers. The palace was the abode of a powerful chief in Ibadan enclave, called “Ba’ale Irefin”, who ruled from 1912-1914. Preserved at the ancient palace are ancient diaries showing old records of events that took place at the Erefin Palace in the olden days. Among the numerous rooms in the palace are the clan’s ‘spiritual powerhouse’ and the judgment room where misunderstandings within the clan are resolved or punishment meted out to the iniquitous. It is worthy of note to mention here that a part of the palace was used in the popular old Nollywood movie Saworoide. It is however sad to know that the palace, although still occupied by the Irefin clan, is not treated as a historical object of great worth. The environment is dirty and not well taken care of, as dirt litter the floors and corners, and smokes from cooking fire places staining the old walls and roofs with sooth. See photos of Naijatreks' recent visit to the ancient palace here. Some old photos of the Irefin Palace taken in 1985 show that at some point between 1985 and now, some parts of the palace was redesigned/reconstructed as it looks a little bit different.